Ismael Alcaraz, age 72, a Fairport Harbor resident, passed away on Oct. 13, 2018 at TriPoint Medical Center. He was born on June 17, 1946 in Leon Guanajuato, Mexico to Jose and Basilisa (Pompa-Gomez) Alcaraz Zamaro. 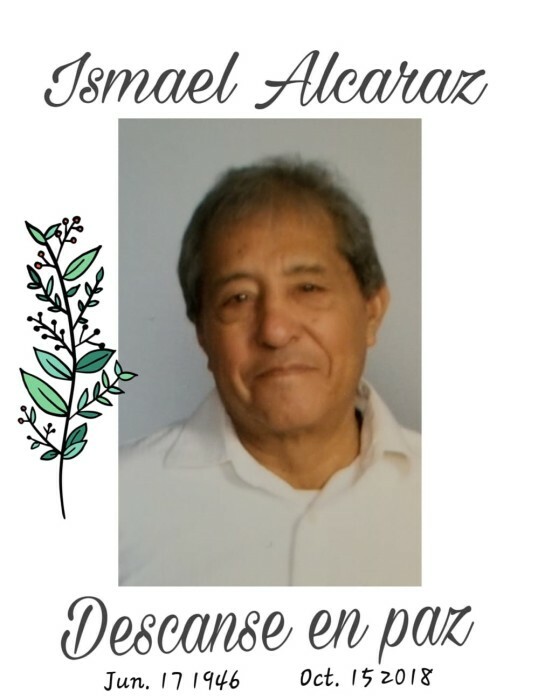 Ismael worked for various area nurseries and factories. Mr. Alcaraz was a member of St. Mary Church in Painesville, loved to pray the rosary daily. He was very strong in his Christian belief. He enjoyed watching soccer and baseball, and attending his grandchildren’s soccer games. He is survived by his wife, Gloria Prado Lopez of Mexico; daughters, Rosalba (Francisco) Villa of Fairport Harbor, Micaela, Magdalena, Fatima, Martha, Mariana, and Adriana all of Mexico; sons, Ismael Alcaraz of Milwaukee, WI and Jose & Agustin of Mexico; grandchildren, Cynthia, Daniel, and Francisco of Fairport Harbor and 23 grandchildren in Mexico; nine brothers and two sisters also survive in Mexico. Friends will be received from 4:00-6:00 PM, followed by a Mass on Friday, October 19, 2018, at St. Mary Catholic Church, 242 North State St. Painesville.